Spoiler alert! ... If you are likely to be on my children's gift list please wait until after Christmas to read this. I wouldn't want to ruin the surprise! It has alway been a challenge to balance the magic between work and home during the holiday season. It is probably fair to say that my home life suffers during this time of year, as the demands of the shop are great. It is fortunate that we all love the store so much! Even my children are willing to spend many late nights down at the Castle decorating and crafting in the studio while I work late to help shoppers bring wonder home for Christmas. That said, I am particularly proud of the little bits of wonder we have managed to make at home this year. For the better part of two weeks my family has been crafting a little village of elemental creatures at the workshop that is our kitchen table. Made from pinecones, acorns, thistle down, and other collected goodies from our wanderings, the wee folk have sprung to life. 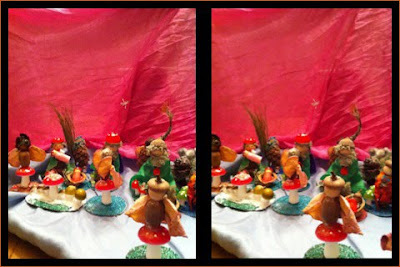 I took a stereoscopic photo of a few of them to show you. If you cross your eyes and stare you might just see them as we do. Next we turned our efforts to a gingerbread house. My girls and I have been studying traditional building materials and techniques, and vernacular architecture from around the world. (I have to thank Builder's Booksource down the block from the shop for inspiring us on this adventure!) We decided that it would be a great challenge to build a model of one of the structures we've studied. The younger members of the family instantly set their hearts on The Church of the Transfiguration (1714), Khizi Island, Russia. 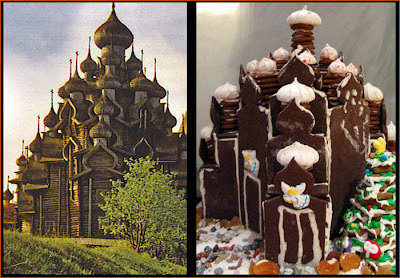 I'll admit that I wasn't positive about the idea until we settled on gingerbread as the building material. The suggestion to use meringues for the twenty-two onion domes settled the matter and we launched into the project with sweet delight. Four days, and many pounds of sugar later we have triumphed! Here too it might be helpful to cross your eyes and squint to see it like we do. As ever, it is the process of making something from nothing that delights me. In this case it is the memories that we are crafting out of pinecones, glitter, and gingerbread dough, that will make this holiday season forever dear. You've all done a marvelous job! Happy Holidays! I am squinting and crossing my eyes at the talent and wonders that come out from your heart and home! Wonderful girls! That is one spectacular gingerbread church! Very impressive. I WISH YOU AND YOUR FAMILY A WONDERFUL NEW YEAR! !